I attended Keith Ellison's appearance at the Humphrey School last week, where he was cosseted under the guise of being moderated by Larry Jacobs, who runs the school, along with Rachel Stassen-Berger of the Pioneer Press. The Cowles auditorium was full and, even though I obtained a ticket the day the event was announced, was forced to take a second row seat, on the right naturally. To borrow from V.S. Naipaul, I was among the believers. I'd never seen Ellison in person before and was unprepared for my shock at what an astonishingly mediocre fellow he was. Unimpressive by almost any measure, his being in Congress perfectly represents the degradation of politics on the far left. And on the far left he is: banal, badly educated, badly spoken, not in the slightest bright, indeed quasi-thuggish, a pencil tucked behind his left ear as he took the stage to much applause. Democrats are a long way away from the intellect and grace of my home state's senator, George McGovern, no matter how out of sync his politics were in 1972. The man was not an embarrassment but Keith Ellison is, perfect for a state that doesn't know how to stop embarrassing itself nationally. The putative topic of the event was "What is the future of the Democratic Party?" It's a question that Jacobs & Stassen-Berger never got around to asking, which shows the degree to which this was a liberal gathering and not an actual event of substance. Everyone on the stage being steadfast democrats, of course, might have had something to do with that. Still, at times, Jacobs surprised me with his questions. So too, Stassen-Berger but only once, when she said Ellison's congressional district, CD 5, had come in 7th out of 8 with respect to voter turnout. Ellison instinctively (and instincts, as befits a thug, are all he has) pushed back immediately. Oddly, the reporter had nothing on hand to back her up, bleating in response that she'd checked the website of the Minnesota Secretary of State for her blasphemy. They agreed to disagree, with the reporter saying that she'd tweet if she was wrong, obsequiously including Ellison's handle in her tweet. From that point onward, she nodded, Hillary-like, at any and everything he said, including when he was turned toward Jacobs, leaving only the back of his head at which to nod. I became grateful for my second row seat. The particulars of Ellison's appearance were excruciating and, of course, never reported upon by local media in attendance. The headlines were: Ellison thought Tim Walz would be the next governor and Betsy Hodges would win reelection as the mayor of Minneapolis. For a lazy press, that was more than enough. I happen to agree with the first prediction but not the latter. Yet only by attending were the particulars of this event available and therein lies the substance. Imagine, the substance of a story not being conveyed to you by our media, local or national. Ellison never answered what the future of the Democratic Party was, not only because he wasn't asked by the ersatz moderators, but more surely because he had no sound answer. What did he say? He talked about Planned Parenthood, more than once, saying "it gets clear to you." Right. At one point he said PP was threatened "with repeal." This is an ignorant man. The clear cut case of PP selling fetal body parts was "doctored videos." What does his party stand for? Ellison quoted the Pledge of Allegiance, saying it stood for "liberty and fairness for all." Those words don't appear in the Pledge and neither moderator corrected him. Liberty and justice for all, of course, are the words in the Pledge. Ellison said the Democratic Party stood for: 1. Economic fairness "there's enough money" and 2. Fairness: "Government helps things get better" or words to that effect. He wanted people to be able to retire and wanted better schools, so that "parents can aspire for their children." That's an exact quote. The closest he got to answering the question of the event was that democrats focused on presidential races too much and not on local ones, focused too much on likely voters instead of other voters. Who those other voters were he didn't say and there was no follow up question. Indeed, a lack of follow up questions defined this event. Painfully to me, but honestly, Ellison said Minnesota democrats held every statewide office and two US Senator seats. Mercifully, he wasn't astute enough to drive the point home and say that the DFL has held the state Attorney General's office for fifty years. He claimed, not implausibly, his turnout in CD 5 kept the republicans from winning those races. That might be true but I'd add the sustained political incompetence on the part of MNGOPe is no small part. There was a great deal of chaff I had to separate in order to find the occasional grain of wheat in Ellison's remarks. Nevertheless, I persisted. 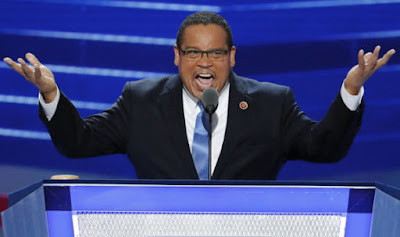 To fairly summarize the balance of Ellison's remarks, he doesn't mind demonizing people when they're wrong; repealing the ACA would hurt people; Trump will lose in 2020 because he will damage the economy and increase unemployment unless he doesn't and is seen as a reformer (all said in one breath, and, again, unchallenged by the moderators); progressive politics can win; Minnesota democrats are indebted to WIN Minnesota, the Kaplans, Vance Opperman, Take Action, NOC, Indivisible, the DFL's coordinating committee, and Hubert Humphrey, saying "we're beneficiaries from history." From. Explaining the rural/urban divide in Minnesota that favored President Trump, Ellison reassured the assembled hive mind that it was worse in Michigan. "But Trump won Michigan," didn't say the moderators. This was what I had to process in real time. It was all I could do to take twelve pages of notes, from which much of this post is taken. Some national media picked up on a key point that Ellison made but the moderators certainly didn't when he said it and local media ignored it altogether. Quelle surprise. That key point was that Obama, in his view, didn't do nearly enough "for the party." He went on to say "his legacy is in danger," apparently not realizing that Obama himself said he was on the ballot and America comprehensively rejected it last November. Again, the moderators weren't there for an injection of reality and let most of his comments pass unremarked upon. To be fair, perhaps I misunderstood their role from the outset. Remarkably, Jacobs brought up Ellison's abysmal voting record in Congress, suggesting to me he's been taking testosterone supplements. Ellison was clearly shocked, if not offended, when facing actual facts and squirmed away from his record by saying he'd had a torn something tendon and once had a child graduating, ending with the fake statement "I have an excellent voting record." There was, of course, a good deal of Trump trashing by Keith E. Hakim that received rote applause from the assembled seals. Laughably, he said that Trump was "openly hostile to core American values." Ellison claimed Trump stoked "economic and racial resentments," which belied the naked anti-white messaging from the left as well as mockery of anything rural. Ellison's solution? "We need more healing." My translation: America rejected our force fed agitprop of cultural Marxism and democrats are SOL. In a moment of what he thought passed for lucidity, Ellison said that Trump voters shouldn't be called suckers but instead be told he isn't delivering. Somewhere Justice Gorsuch, ICE and Trump voters are laughing. The low point of the gathering was Ellison not being asked about the appearance in Minnesota of the horrific Muslim practice of female genital mutilation. I've been told that I shouldn't have had any expectation he would be, leaving me at a loss to know which was worse: the failure of moderators who think highly of themselves or a citizenry used to the Regressive Left's dominance of politics and culture in Minnesota. Over this past weekend we gained more information, if such were needed, about the abysmal future of the Democratic Party. In a newly released Washington Post–ABC News poll, Democrats have plummeted on the question of relatability with the middle class. The "democracy dies in darkness" Washington Post waited until the penultimate paragraph of its very long story to reveal the worst of it: Trump would win the election if it were held now, including the popular vote. Providing a finishing salt of insanity to this already unappetizing dish, DNC Chair Tom Perez recently stated flatly that pro-lifers were not welcome in the party. Approximately 30% of democrats consider themselves pro-life. Democrats haven't wielded this little political power at the state level in 75 years. The Senate is very likely to be more republican after the 2018 elections. Both Camille Paglia and Michael Moore have recently predicted Trump will win reelection in 2020. Ellison at the Humphrey School was an exercise in group delusion and the future of his party is dire in the extreme; paint it black. Minnesota republicans would do well to wake up to this new reality, because although it wasn't reported this way, it seemed like what I witnessed was a political Heaven's Gate. Is 2018 Already Slipping Away From Republicans?